The BullMastiff is a cross between a Mastiff and a Bulldog. "Originally bred to find poachers, The Bull Mastiff has proved its value as a family dog." 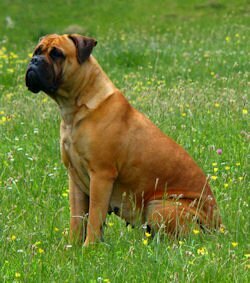 Originating from England, the Bull mastiff was developed to work with the law to track down, tackle and hold poachers. This dog breed was also prized for hunting, guarding and as an aid in army and police work. The dogs are fierce and threatening to criminals. This breed is a member of the American Kennel Club's Working Group. Today's Bullmastiff is a reliable family companion and guardian. The Bull Mastiff is a very powerful dog, but the size is not cumbersome. With a broad wrinkled head and fairly short, square, dark muzzle, the breed stands from twenty-five to twenty-seven inches in height. The male dog is from twenty-four to twenty-six inches. The weight is 110-133 pounds, with the female weighing in at 100 120 pounds. The short, slightly rough coat comes in brindle, fawn or red, often with black markings on the head. The Bull Mastiff will do okay in an apartment, but the situation certainly isn't ideal. This dog breed needs plenty of exercise. It is relatively inactive indoors and will do best with a home that has a large fenced yard. If you don't have a fenced yard, you should be prepared to take your dog on a nice, long walk twice a day to keep it happy. These dogs crave human attention and are not happy being left alone for long periods of time, so are not a good choice for people who work long hours out of the house. This is a powerful breed of dog, and needs a firm master. It may not a good choice for first time dog owners. A strong handler who can assert authority is ideal. Puppy obedience training is necessary for this breed, because socialization is important at an early stage. 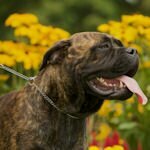 Socialization with both people and other dogs is required, as Bull Mastiffs tend to be aggressive with other dogs and are reserved with strangers. The BullMastiff is a more aggressive breed than its cousin, the Mastiff. Ongoing training should be scheduled to contain the independent instinct of these dogs. The Shorthaired, slightly rough coat of this breed is easy to groom. Comb and brush the coat with a firm bristle brush. Bathing and shampooing are required only when your dog has gotten into mud or something with a strong odor. There is very little shedding with this breed. The feet should be checked regularly and the nails should be trimmed occasionally. Be careful not to overfeed your dog. These dogs have a tendency to be lazy and they can get fat if not fed properly. These very hardy dogs are accustomed to harsh conditions and are rarely ill, but there are some health problems you should be aware of. Some dogs may suffer from hip dysplasia or eye problems such as cataracts. Also, they can be prone to boils on the lips and bloat. This breed tends to drool and slobber! However, his protective spirit will far outweigh these little inconveniences. 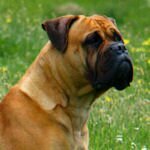 The Bull Mastiff is a great watchdog and will defend his beloved family with vigor. 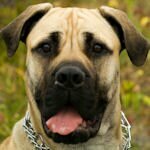 Dog Breed Family The Bullmastiff belongs to the family known as working dogs group. Alternative Names The Bullmastiff is also known as "the keepers night dog!"